SPONSORED LINKS Few months ago there is a video of that traffic enforcer who has been ran over by a motorcycle because it was going to fast? I know some of you can't remember . 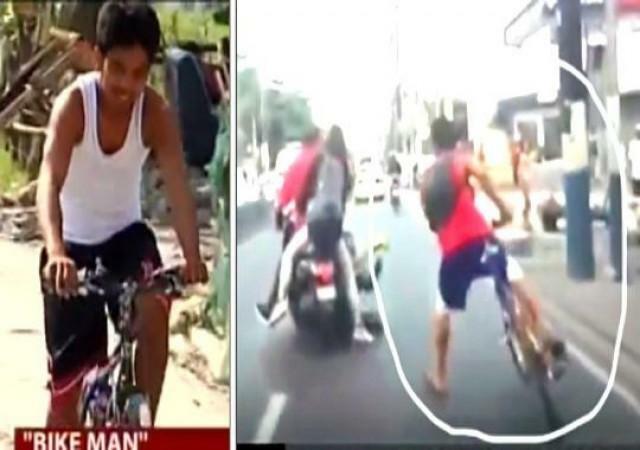 What caught the attention of most of its viewers would be the guy on the bicycle who without thinking twice left his bike and ran after the motorcycle. According to a news that the hero known by everybody as “Bike Man” has been revealed. He is Jecenth Mateo; a 22-year-old construction worker in Taguig. Jecenth says, he was on his way to work when he saw the incident and even got late, but even if that happened he was happy serving justice. The traffic enforcer was thankful of the heroic act, telling that those acts are not seen as much today. Jecenth, who lives in Cainta will be awarded on Monday by his local government. There are still unknown heroes who are willing to served without expecting for any reward.